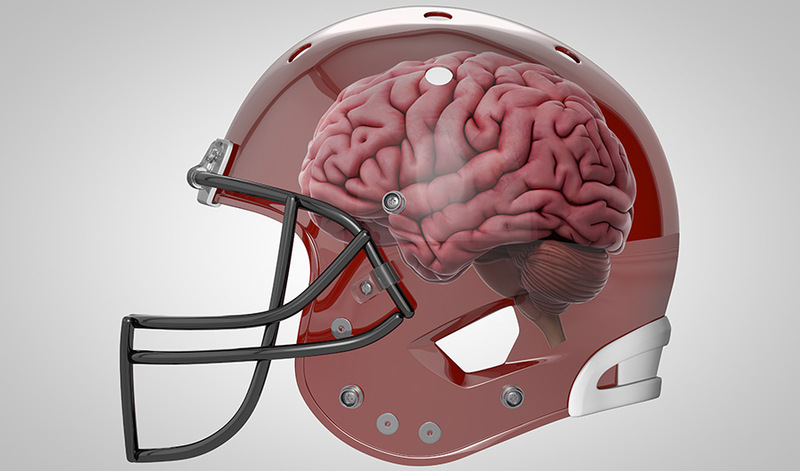 New study suggests at least one in 10 NFL players could eventually develop the brain disease. (Inside Science) -- The authors of research published yesterday in the journal Neurology estimate that a minimum of 10 percent of NFL players will eventually develop the degenerative brain disease known as Chronic Traumatic Encephalopathy, or CTE. That would mean that for any given NFL play, the researchers said, a minimum of two of the 22 players on the field could be projected to develop the disease, which is associated with symptoms such as cognitive impairment, impulsive behavior and suicidal thoughts. "The prevalence is high under any reasonable assumptions and this is scary," said sports injury epidemiologist Zachary Binney from Emory University in Atlanta, who co-authored the new report with sports safety researcher Kathleen Bachynski from NYU Langone Health. The research builds on a July 2017 study that found evidence of CTE, which can only be diagnosed after death, in the brains of 110 of the 111 former NFL players examined by a group at Boston University. After the study was published in the journal JAMA, many experts rushed to highlight the lack of context in that number. The study included only brains that were donated after death, which likely created a bias because families would be more likely to donate a players' brain if they noticed symptoms associated with CTE. It's impossible to know at this point exactly how biased the sample of NFL players' brains was. But the new study attempts to gauge what can be taken from the knowledge that at least 110 brains were diseased. The new calculations look at a range of possibilities, including the seemingly unlikely event that the JAMA study's sample of 111 brains included every brain of a former player who had CTE and died during the 2008-2016 duration of the study. Comparing the number of diseased brains to the total of 1142 who died yields a minimum prevalence of 9.6 percent. Jesse Mez, one of the authors of the 2017 JAMA paper and a neurologist at Boston University, referred to the new research as an important extension of the work in their paper. "It starts to provide a framework or a ballpark for what the prevalence of the disease among NFL players might be," he said. Earlier this year, Adam Finkel, a former rulemaking director and regional administrator for the Occupational Safety and Health Administration who now studies quantitative risk assessment at both the University of Michigan and the University of Pennsylvania, used a different approach to report a minimum risk of about 1 percent. "One percent is a huge number," said Finkel. "It doesn't matter whether it will grow to 10 percent or 15 percent or 50 percent. It's already a big number." Both approaches use the 110 brains diagnosed with CTE to generate their estimates. Finkel, working with Mayo Clinic neuroscientist Kevin Bieniek, estimated that there were roughly 10,000 players who played in the NFL over the same time period as the people included in the JAMA study, roughly 1963-2008. Dividing 110 by that number means the equation reflects the minimum rate of CTE among players who were active in that time period, Finkel said. The Binney and Bachynski approach looked at the number of players who also died during the study period of 2008-2016 but did not donate their brains for study, which Finkel said means that the new study could be answering a slightly different question: Of the former NFL players who died between 2008 and 2016, what was the minimum number who had CTE? There's a lot that is not yet fully understood about CTE and the risk that football players face, especially the millions who will never play in college or the NFL. Disentangling those risks at each level, from youth football and on to higher levels, is difficult. It would certainly help to have a test for CTE that would apply to the living, said Binney. But for players who reach the NFL, researchers are finding a large risk of a potentially debilitating disease, even as they are finding indications that former NFL players are healthier than the general population in most other ways. "We can be picky about the exact approach and whether you take Adam Finkel's approach or whether you take this approach, and you do get certainly a different baseline," said Mez. "But either way, it's too high."